These deliciously scented handmade soaps are made entirely from premium oils of organic fair trade virgin coconut, organic fair trade sustainable palm and organic first cold pressed extra virgin olive, pure aromatherapy essential oils and ground earth clays or botanicals. Pick the scent that's perfect for you and another that's perfect for your friend. A. Fresh Spearmint (formerly Spearmint Sprig)-Fragrant and refreshing with a minty aroma. B. Quiet Time (formerly Floral Rain)-Its calming essential oils might just quiet your busy mind. Subtle, soothing aroma. C. Cedar Spice-Rich and earthy, you'll smell hints of cedar and the fresh outdoors. D. Sweet Almond-Relaxing with a pleasant, sweet aroma. E. Antique Rose (formerly Rose Patchouli)-A rich, aromatic bouquet of rose geranium and patchouli. F. Lemon Crème (formerly Lemon Fresh)-An uplifting citrus soap - it might just remind you of a sweet dessert. I was having dry itchy skin , and thought I'd buy a few soaps to try . Among others tried Cedar Spice first ! WOW ! This is now a Super Favorite and I will buy more ! Great in every way , I love the scent and performance , Wonderful Soap ! Try it , you'll love it ! *****+ just put Spearmint in my other bathroom ! Great Soap and lasts ! Wonderful and has alot of lather...good price and we love Lehman's..
My skin was very dried out from normal soap and shampoo. I am very happy at how this soap moisturized my skin. Thank you. We have use this soap for years and loved it, but they must have changed makers or formula as has a new name. The Antique Rose now stains any light colored wash cloths and it does not come out. Smells great, but stains so be forewarned. 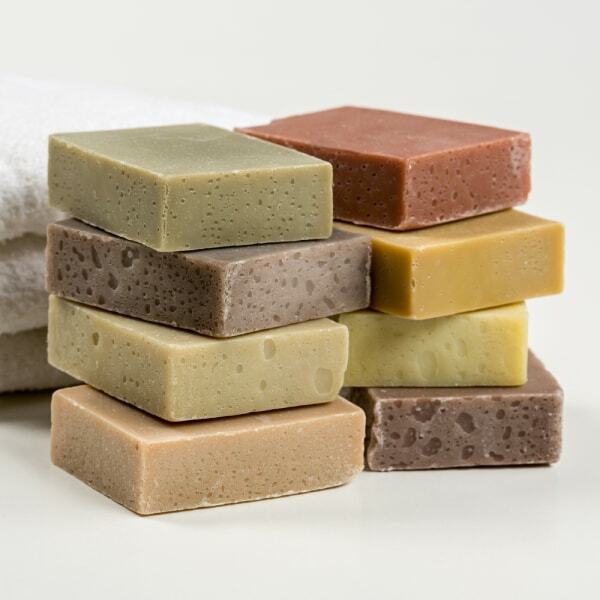 We like the different soaps very much, very good for sensitive skin and makes you feels clean. Also has great smells. I ordered several and have only tried the spearmint so far. I love it! I had purchased the cinnamon scrub soap at the store a little over a year ago. Decided to order it online this past Dec. because I loved the exfoliating property and wanted more. It is NOT CLOSE to the same bar I had purchased in the store!! The scent is wonderful, but I was VERY disappointed with the product purchased recently compared to the first one purchased in store. NO exfoliating additive AT ALL! That was the main reason I wanted more. If you had never purchased this before you would have no idea what you are missing!The ID of cinnamon is correct, but scrub is surely a joke. The soap itself is nice, it just wasn't what I thought I was getting. The homemade lavender soap was the best I've ever used. No dry patchy skin. And it smells good enough to eat. I wanted to bite it!